Achtung Kunst! | Fablab Neckar-Alb e.V. Achtung Kunst! und Kunst! sind Projekte des FabLab Neckar-Alb e.V. zur Verschmelzung von Technologie und Kunst. Renommierte Künstler unterschiedlicher Genres werden eingeladen ihre Arbeit vorzustellen, ihre Technik zu demonstrieren und später einen Auftritt zu absolvieren. Die letzte Achtung Kunst! mit Kode9 war am 29.4.2017. Impressionen findet ihr hier. 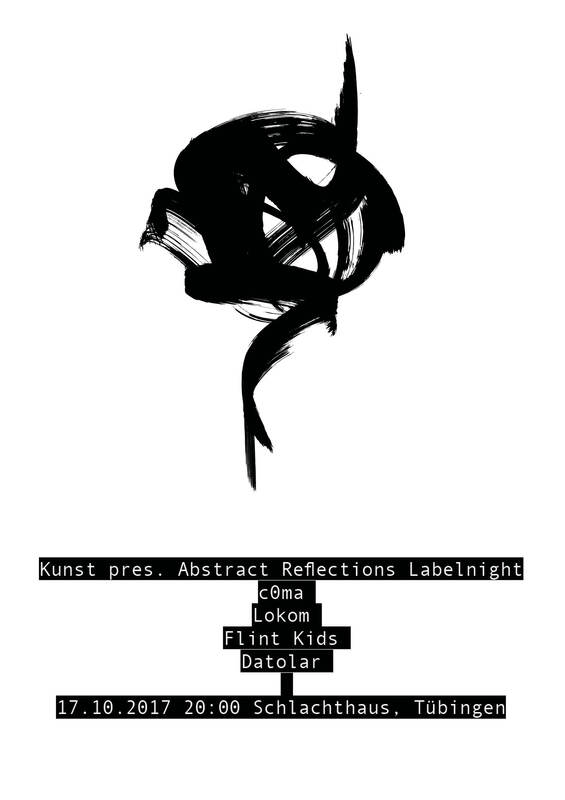 Abstrakt Reflections is a platform & netlabel focused on the types we love. We watch for things more left-field, a creative space for abstract rhythms, otherworldly soundscapes and especially invention in electronic music today. We are open to anything else anyhow, devoted to high quality electronic music with a distinctive sound. Being creative and doing everything with heart is what we stand for. Datolar is 46 years old Gerald Becker from Frankfurt, Germany. Gerald has been listening to music over decades, from Skinny Puppy to Ganzheit, from HECQ to Autechre, from Richard Devine to Xela. Back in the 90’s he released various EPs as Virtual Symmetry on the legendary label Eye-Q Records. Data and Modular. Trial and error. Different sources and constant change in the sound and structures is what defines him. 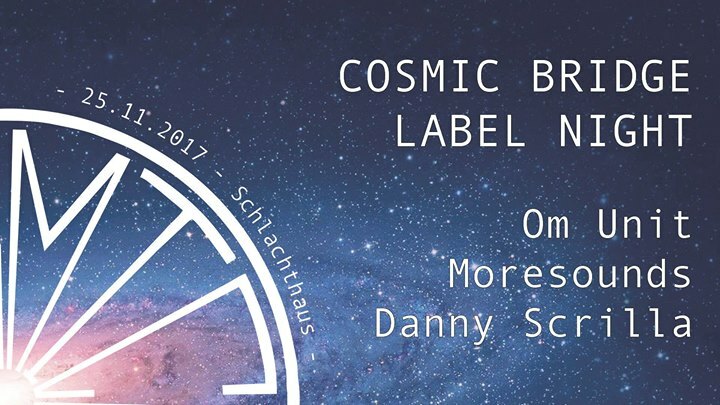 With the Cosmic Bridge Label Night we celebrate five years of one of the most innovative and inspiring record labels in the worldwide bass music scene. Redefining the boundaries between Jungle, Drum and Bass, Dub, HipHop and Footwork, label founder Om Unit has brought some of the most talented producers together on a platform that sidesteps the pitfalls of genre-constraints. Drawing from such a broad bandwith of musical styles and influences, the cosmic family has grown over the past years into a global community of open minded musicmakers, DJs, visuals artists, promoters, writers and most importantly fans. Bristol based producer and DJ, Jim Coles has been a significant and pioneering presence in various dance music circles since the late 2000s. Being a true fan of Jungle music since the earliest days of the genre, Coles fluid approach on sound system culture has stimulated a worldwide reignition of bass-heavy uptempo music and culture. His personal explorations have lead to new amalgamations of styles such as Jungle, Footwork, HipHop and vintage synth sounds. These he displays on his own Cosmic Bridge imprint, as well as legendary record labels like Metalheadz, Exit Records and Planet Mu. The spirit of dub runs through Moresounds veins like no other artist. Being a true scholar of Kingston legend King Tubby, the parisien producer forges high-pressure uptempo music with the crackling warmth of vintage analog gear. His unique style draws from the distinct use of classic dub effect units such as the Sherman filter bank, hard-to-track-down vocal cuts from Jamaican reggae clashes and fast pace syncopated breakbeat chops. This signature sound has manifested in many timeless releases on international dub-heavyweighters such as Lion Charge, ThirtyOne Recordings, Moonshine Rec. and ZamZam. Operating from downtown Munich, Danny Scrilla has been one of the most creative suppliers of synth-heavy halftime productions that stomp both the grounds of clubs as well as radio environments. Drawing from his own background with reggae and dancehall music, Danny holds a vast catalogue of inventive remix projects as well as solo works and collaborations. His part-time beatmaking has manifested in numerous highly acclaimed releases on international imprints such as Amar, ZamZam, Civil Music and of course Cosmic Bridge. Besides that he still finds enough time to provide an astounding portfolio of contemporary memes that can’t be contested. Cosmic Bridge is the creative sanctum that all three artists share in common.Let’s come together and celebrate half a decade of inspiring music for open minded people.